i am not sure why the leaves are looking shrivelled and dry????? It's hard to see from the photos, but it looks like the leaves may not be getting enough water from the roots. This can be caused by under watering, or when overwatering causes roots to rot. Phals like to be watered just as they approach dryness, but not before. I suggest gently lifting the plants out of the pots to take a look at the root systems; healthy roots are firm and white or green, dead roots are usually brown and mushy. If most of the roots are dead, I suggest repotting right away. Otherwise, slide the plant back into its pot and try watering slightly more often. Another possibility is cold damage; the weather has been nice here in Minnesota lately and it looks like the plants have been indoors, but perhaps you splashed a lot of very cold water on the leaves somehow? The yellowing leaf on the rightmost plant in the first photo looks like it might be sunburn; if it appeared recently, I would put the plant in a spot with slightly less intense light. thank you Cable..... do the leaves fall after they have bloomed for a bit??? i see you are near!! i took off the kinda shriveling leaves...... and hoping the new buds bloom!! I'm glad the roots look healthy. No, the leaves should not fall after the plant blooms, though the oldest leaves may drop eventually when they are a few years old. Phals are low-light orchids, but they still like fairly bright light by indoor standards. Direct sunlight is too much, but bright filtered light (about 1000 foot-candles if you have a way to measure it) is about right. They are fairly adaptable to more or less light, within reason. If the light is low, the leaves will gradually become dark green, and they adapt to bright light by making the leaves paler, and yellowish or reddish. These plants look like complex hybrids involving many parent species; without a tag you are unlikely to be able to get a definite ID. thanks.... oopsy, I meant flowers-blooms, not leaves.... I picked off the first three. thinking of the white one!! The flowers last for a few weeks, maybe a bit over a month if you're lucky. 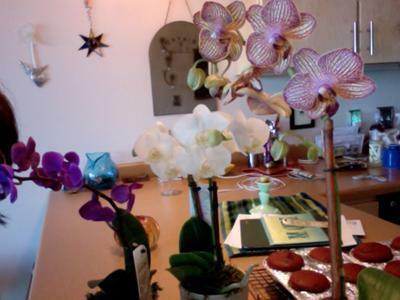 Most orchids bloom once a year, more often for some types or if you're lucky. Sometimes orchids are sold with a small nametag in the pot that has a full identification of the plant. 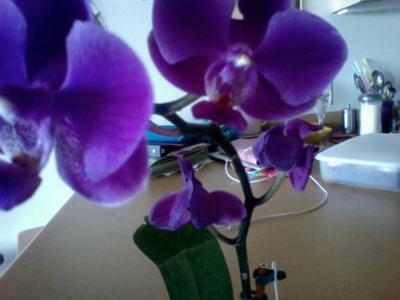 Most orchids sold at places like supermarkets do not have such a tag; I don't know why. My partner and i tried out a couple of companies searching for the bestdissertation scam and also My partner and i has been quite unhappy. it absolutely was next in which my own coworker recommended My partner and i test obtaining this kind of website link using one of one's sites. I came across a couple of and also each is extremely trustworthy. Many thanks in making my own perform less difficult!